Xulfor is a nonindustrial water world, which has 90% or more of its surface covered in an ocean of water. Non-industrial waterworld known for it's few foodstuffs manufactured from unique marine life on the planet. The planet has no significant land masses above sea level. Salos, the principal city, occupies much of the Salos Sea mount, one of the highest points on the world. There are both northern and southern ice caps, and several life forms have evolved to live on them and the surrounding sea. Xulfor was settled in the mid 300s when some of the exploration teams decided to set up permanent residence in the original scout service base. A farming industry provides a modest income today. The original habitation on Xulfor was an Imperial Interstellar Scout Service scout base. The original type 92 dome is used as the starport administration facility today. The starport consists of a class D facility which is administered by a group of individuals from the Xulfor Central Council, which is a loose group of representatives from each city. The starport consists of a surface landing pad, which resembles a large off-shore oil rig. At the center of the pad is a shaft which contains elevators, etc. The shaft connects with the type 92 dome mentioned above. The landing pad is not essential, as most ships can simply land in the water and dive to the underwater plateau, but in practice few pilots are trained for such maneuvers, and accidents, sometimes serious, have occurred. Most of the offices, warehouses, etc., are located in the main dome. Three satellite domes are now used as offices for each of the governments on Xulfor. 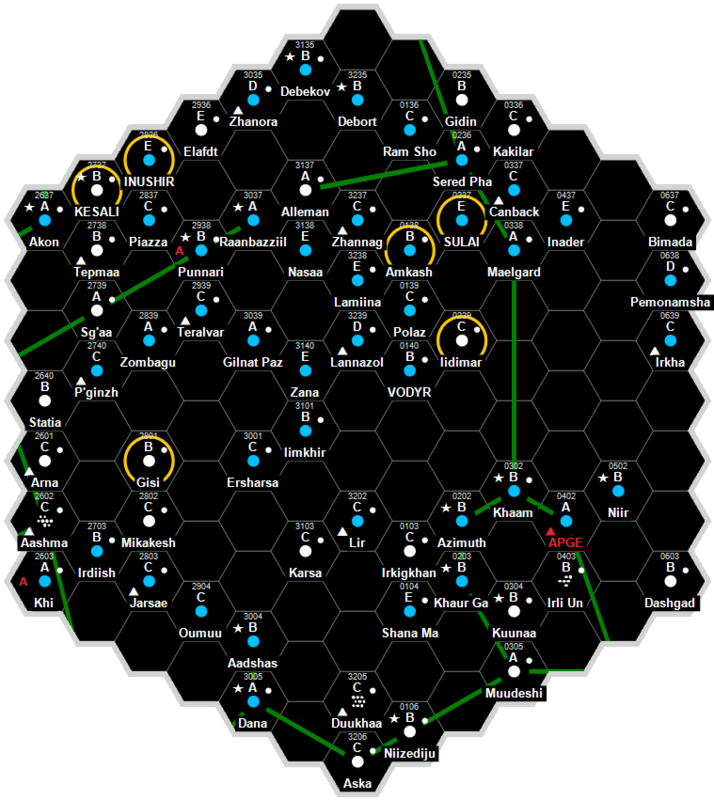 These governments — Zavatech, Kungalow, and Asenmar — are fierce rivals; they have been forced by mutual distrust to turn the starport area and other offworld enclaves into a Free District, under no national control. Zavatech and Kungalow are largely economic rivals, the former a representative democracy with a strong base in sea agriculture, the latter a feudal technocracy striving to catch up. Asenmar is poorer and far more aggressive, and is rumored to be planning an open break with the other two, on which the nation's charismatic dictator blames Asenmar's poor economy. Control of certain important fishing banks and undersea farm areas in the extensive shallows of the southern hemisphere - and hence control of lucrative off·world trade in various foodstuffs-is the goal all three nations pursue. Offworld contact remains in the hands of the Xulfor Central Council, which serves as an administrative body for the starport and related areas, and a regulatory group for offworld relations on and off Xulfor. This Council was originally established by a joint treaty between Xulfor's three governments, as a means of keeping the starport out of anyone nation's control. Since that time (two and a half centuries ago), the Xulfor Central Council has grown in power and importance. Tariffs on starport trade supplement the annual budget of the three nations, and this wealth has been put to good use in expanding facilities and developing additional services. The Council maintains a regiment of security troops, mostly drawn from the planet (citizens of all three nations are in this unit, having sworn an oath of loyalty that puts Xulfor and the Council ahead of national loyalties), spearheaded by a company of mercenaries from off-planet. The Central Council is striving to make Xulfor self-sufficient, and exercises considerable control over off-world corporations attempting to exploit the world. Xulfor, as a member world of the Third Imperium has a member of the Imperial Nobility overseeing the world. This page was last modified on 30 December 2018, at 12:18.